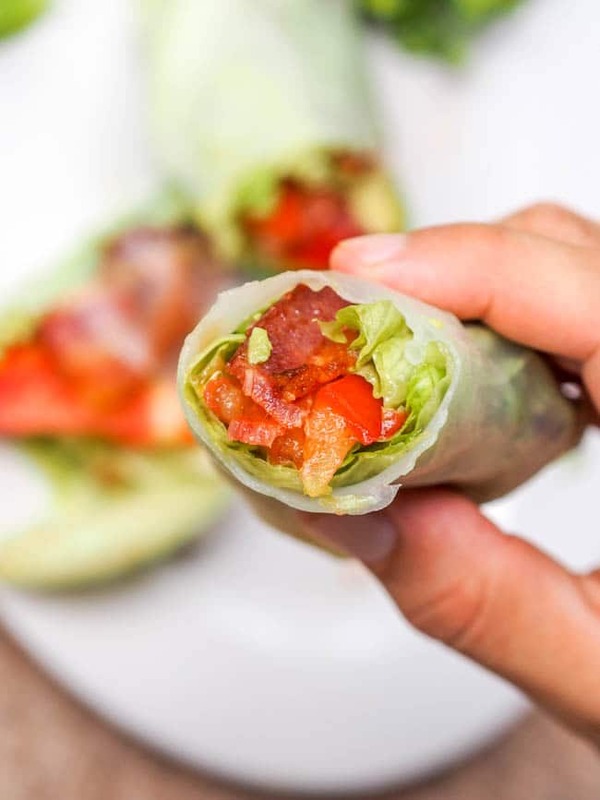 The classic BLT reconstructed and offered in new form — BLT Lettuce Wraps with Avocado wrapped up in rice paper wrappers for easy eating. Low Carb – NO bread needed! – these are made with only six ingredients and 30 minutes and make for the perfect appetizer, lunch or light dinner. No bread to distract you from the full flavors of the real stars in the standard sandwich. Low carb, paleo, dairy free and gluten free. Summer roll recipe? YES! Lately I’ve been on a serious summer roll recipe kick. It’s what I’ve been craving and making several times in the past month. It must be the lack of fall here in Costa Rica. Instead of golden and red colored leaves floating through the sky and cold breezes it’s been hot sunlight and scorching temperatures. It’s no wonder I’m not dying for my baked pork chops or roasted cauliflower soup at this time of year. Instead I want cold no cook meals. Something light and crisp. A Summer roll recipe is perfect for the occasion. Over the years I’ve made all sorts of appetizer “roll” style recipes – my current favorites being my avocado and vegan summer rolls, vegan zucchini rolls, and turkey avocado rolls. Now I wanted bacon though. Surprisingly whenever I travel internationally I crave BLTs. This happened the first time back in 2013 when D and I spent 9 months backpacking around Asia. One week it just hit me. I didn’t want Thai curries and noodles, I just wanted a proper well made BLT sandwich. It sounds super simple, but when you’re in Asia it can be fairly difficult to find some western favorites sometimes. I found a spot though. A small expat owned cafe in Chiang Mai, a city in Northern Thailand. They had a simple and delicious BLT. Well toasted bread, crunchy bacon, juicy tomatoes, refreshing lettuce and a light spread of mayo. For $2 it was perfect. And the only thing I ate for a solid 2 or 3 days. Sometimes you just have to give your body what it wants. Here in Costa Rica that BLT urge came rolling by again. This time instead of bread I wanted to try making a BLT summer roll recipe, with avocado of course. Think BLT lettuce wraps. Who needs the bread anyway? It’s just a filler that dilutes the full flavor or the rest of the ingredients, if you ask me. We’re all just really trying to get more of key ingredients – bacon, avocado, lettuce and tomatoes. I mostly just need a convenient way to package all of these ingredients together and rice paper wrappers serve their purpose well in this situation. With these BLT lettuce wraps you just have to cook the bacon, chop the other ingredients, wet the rice paper and roll everything up. The rice paper allows for easy eating of these BLT lettuce wraps — it holds everything compactly together – as opposed to lettuce and the ingredients falling apart. I didn’t tuck the ends of wrappers in for a bit of a messy free form look. This also cuts out some prep time so that’s always nicely appreciated. 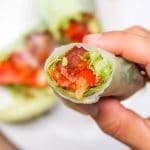 For this summer roll recipe you just need six ingredients – bacon, lettuce, tomatoes, avocado, mayonnaise and rice paper wrappers. Simple, to the point, and delicious. 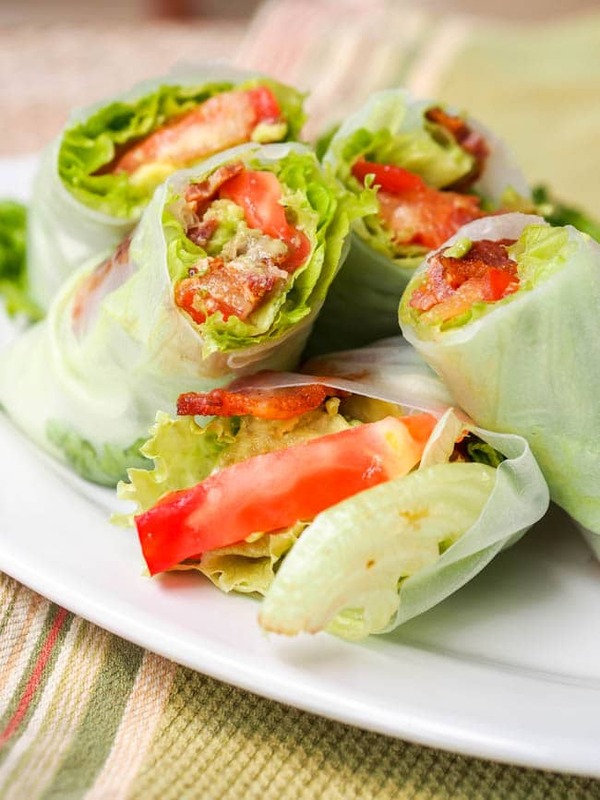 Crunchy bacon, smooth and creamy avocado and mayo, juicy tomatoes and refreshing lettuce, all wrapped up in silky soft rice paper rolls. With these BLT lettuce wraps recipe you really get the full flavor of the most important ingredients. Light, low carb and hearty these make for a perfect lunch or light dinner meal. I’m enjoying these in 90 degree whether but I have a feeling these are great year round. And since I’m now in an indulge type of mood, I might just continue on to dessert – as in my flourless chocolatey vegan protein brownies and vegan chocolate hazelnut truffles. What do you think of summer rolls? Do you love them as much as I do? I can eat them all day long, day after day, just switch up the fillings on me a bit, and I’m happy. I just love how super light and refreshing they are, with none of those heavy carbs or that feeling that I hate after eating a big bread filled sandwich. BLT Lettuce Wraps- The classic BLT reconstructed and offered in new form -- in a Summer Roll recipe with Avocado - these are made with only six ingredients and 30 minutes and make for the perfect appetizer, lunch or light dinner. No bread to distract you from the full flavors of the real stars in the standard sandwich. Low carb, paleo, dairy free and gluten free. Cook bacon in pan until crispy. Drain on paper towels. There’s something about bacon that screams “home” isn’t there?! I love traveling and tasting all the local foods, but like you, when I’ve been out for a length of time, I need something that’s home-cooked flavors. I love your twist on the BLT – turning it into a summer roll is genius! And your summer rolls look amazing! These look delicious. I am a big fan of BLTs. Never thought of making them into a summer roll, but I like the idea. I too love love love BLTS and can feel a bit less guilty about these bread free ones! BLTs are so awesome! 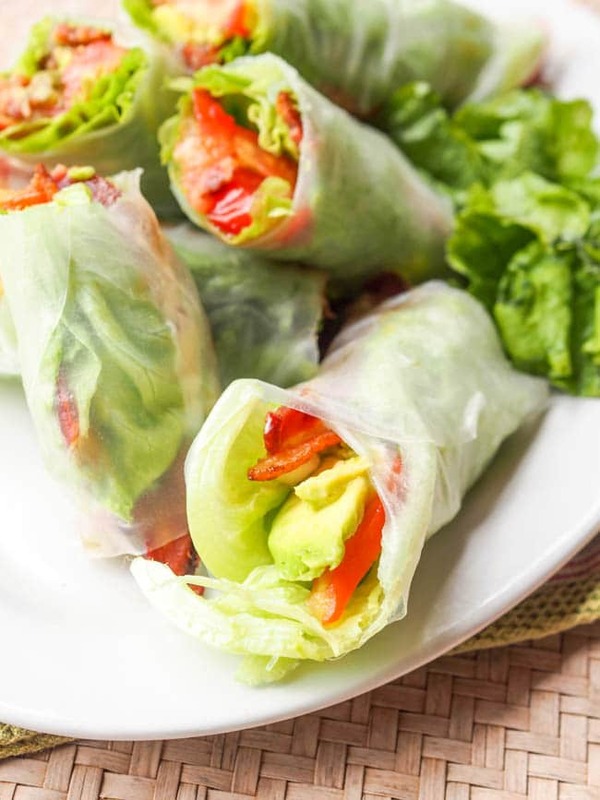 And these summer rolls are a brilliant idea – a little healthier, but still with BLT flavor. I can’t wait to give them a try! Yes – healthier but with BLT flavor is exactly what I was going for. You won’t miss the bread at all! Yum I love wraps made with lettuce, they’re so fresh and tasty! I recently started to make lettuce wrapped burgers and…OMG they’re to die for. A blt in a roll sounds amazing! Lettuce wrapped burgers are the best!! I make those all the time! Would love to hear which ones you’ve been making and can’t wait to follow along your new Canada journey!!! Avocado is one of my favorite foods. I love the creativity of this recipe. Mine too!! I seriously eat avocado every day! Glad to hear that about the initial attempt it all worked out! It can be find of tricky figuring out how to roll them up nicely — took me a few tries as well! YUM! Where has this recipe been all my life? This is such a great idea! Thanks! Aren;t they the best?!?! I love how simple and flavorful these rolls are. They’re perfect for summer and warm days. Where do I find the rice paper wraps in Southern California, since I need to eat gluten free this is perfect for me? You can usually find them in the Asian aisle of a regular supermarket. Whole Foods definitely has them as do all Asian grocery stores. Or you can order them online on Amazon. These look delicious! Do you have any experience making these ahead of time? Wondering if they’d store ok in the fridge before eating them. I think these would be fine stored in the fridge a few hours ahead of time! Happy Friday! Just letting you know I featured this in my weekly Low-Carb Recipe Love on Fridays post. Hope a lot of my readers will click over here and get the recipe! Can you tell me the diameter of the wrappers? I would use the low carb tortillas because I am low carb. Are they the taco size? They are about the size of a regular tortilla, I’m not sure about the diameter. Hope that helps! Wow this is an awesome wrap! It’s like a sandwich without the bread. Brilliant! I made these for lunch today and they were great! I’m thinking I might need a sauce next time though. Any suggestions? Thanks! I think an avocado aioli (blended avocado with a bit of coconut cream, cilantro, lime juice and clove of garlic) should do the trick! If I make these ahead of time will the avacodo turn brown? If making these ahead of time make sure to drizzle the avocado with lemon or lime juice that should help delay the browning process. But yes eventually the avocado will start to turn brown. I’m serving this as A light dinner, any suggestions for sides? Sorry just getting to this comment now, if you’re still looking for side ideas roasted potatoes with garlic and basil or baked sweet potato fries would work well as a side! I think these should be fine if made the night before. Just make sure to squeeze some lemon or lime juice on the avocado before adding it to the summer rolls to help prevent browning. Apologies for the delayed response. Unfortunately I do not know if these would last long in the fridge – I am concerned the bacon will not be crispy if these are kept overnight or for 2 days in the fridge. If you do end up storing these for a bit of time, please let me know how well they keep! Every time I made them I ate them immediately! HI. I love this recipe and want to try but on the nutritional values lists as 2223 calories, 120 g fat. Is this true or a typing error? That is definitely an error in the tool that calculates the calories! Sorry about that – this dish definitely is not that high in calories or fat. Thanks for letting me know – I’ll have to contact them to see what is going on! Hasn’t anybody noticed the outrageous calorie count attached to this article’s recipe? When I plugged the ingredients into my handy dandy tracker, I came up with about 580 cal per serving, not the 2223 that is published here. What gives? Thanks for bringing my attention to this. There is some sort of error in the tool that automatically calculates the calories so please ignore that. It is not correct. It says over 2000 calories!! This can’t be right!! Do you have a total carb count on this? I’ve never used rice paper …. being diabetic, I have to count carbs now. I do not currently have the rice paper wrappers I use in front of my but I think there are about 60g of carbs in 5-10 rice paper wrappers. It does depend on the rice paper wrappers are some are super thin versus regular so I suggest you see which ones are sold in your local store. Sorry I can not be more helpful at this time! How are these dairy free if it has mayo??? Just curious if I missed something. Mayo is dairy free because it is made with eggs and oil. Eggs are poultry, not dairy. Hope that clears things up! Thanks for sharing! Can it be made very far ahead of time? I do not think so, because I’m afraid the bacon will get soggy in the rice paper if you make this days in advance. I just use a piece of lettuce to wrap it in. Rice paper is extremely high in carbohydrates. A slice of whole wheat bread has 1/3 the amount of carbs. 18 grams compared to 59grams. I have made these same wraps on lettuce and they are delicious!! Yep they’re great with lettuce too! !